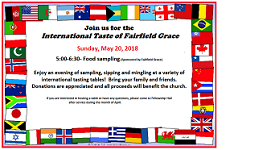 Enjoy an evening of food sampling, sipping and mingling at a variety of international tasting tables, representing dishes from all over the world! Bring your family and friends. Donations are appreciated and all proceeds will benefit the programs of the church. If you are interested in hosting a table or have any questions, please come to Fellowship Hall after service during the month of April. Or you can contact Ben Collen at 203-550-7312 or Benjamin.Collen@gmail.com.